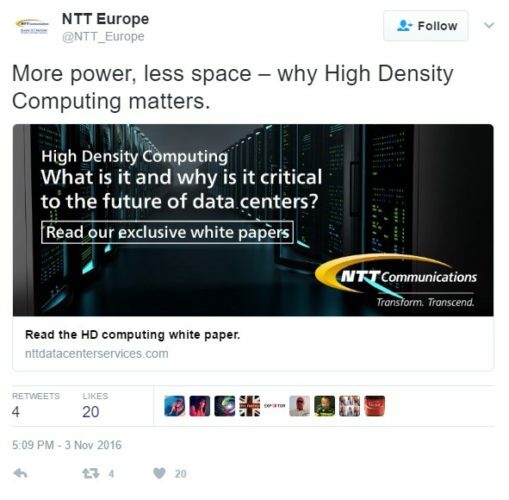 NTT Communications worked with us to generate leads for their data centre services via the promotion of original content on their microsite, such as white papers on high density computing. The aim was to generate at least 10 new leads from the campaign. We targeted very specific audiences on LinkedIn, Google search, YouTube, and Twitter – channels we believed the target audience were likely to use. Our campaigns delivered results beyond expectations, in terms of conversion rate and volume of conversions. For each platform, we identified the ideal method to target audiences across each platform. On Twitter, for instance, we targeted specific hashtags, interests, and followers of data centre and enterprise software related accounts, whilst on LinkedIn targeting was based on location, job titles and company size. Our aim was to drive the most relevant piece of content to the correct person and have them download that content via a click to the white paper itself. 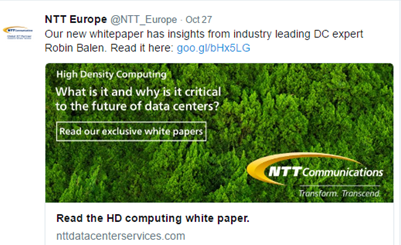 The messaging focused on the educational / thought leadership value of the white papers and the fact they contained exclusive interviews with data centre specialists. Impressions, clicks and CTR increased throughout the campaign on all marketing channels due to adjustments to bids and ad copy.